With the No. 6 seed at stake, peaking Magnolia rose to the occasion to take it, dismantling NLEX, 102-74, and putting itself in a fair and more favorable position entering the quarterfinals of the 2019 Philippine Basketball Association Philippine Cup at the Smart Araneta Coliseum yesterday. 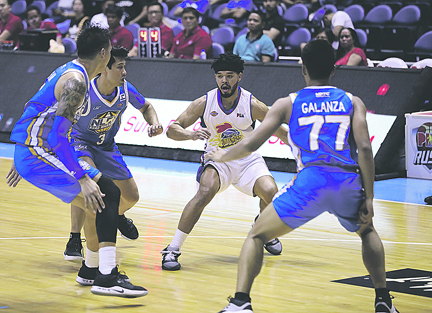 Magnolia’s Justin Melton is trapped by three NLEX defenders, headed by Bong Galanza and Juami Tiongson in a PBA game won by the Hotshots, 102-74. Paul Lee was in his fiery element, firing 18 of his game-high 26 points in the first half, while also adding five rebounds, to show the way for the Hotshots. As a result, Magnolia, which won its third straight game, ended its elimination-round on the right note, claiming the No. 6 ranking with its 6-5 mark to face No. 3 seed Barangay Ginebra, its biggest rival, in the next phase in a much-anticipated best-of-three affair. As for NLEX, it now hopes that NorthPort loses to Barangay Ginebra in the final game of the eliminations to secure an outright berth in the quarters. Otherwise, it shall face Alaska in a playoff for No. 8 if the Batang Pier wins and earns a spot in the next round. Landing the sixth spot was critical as the victor will be guaranteed a best-of-three series in the quarterfinals rather than a twice-to-win disadvantage. Thankfully for Magnolia, it showed up to claim the disputed ranking in the battle for critical playoff positioning. Using a second quarter explosion, the Hotshots were able to break free from the Road Warriors to set up the relatively easy victory. Led by Lee’s offensive exploits, highlighted by four triples in the first 24 minutes of pl;ay, Magnolia ballooned its then four-point lead to 16, 46-30, at the half after outscoring NLEX, 26-14, in the second frame. Carrying a huge lead and a lot of momentum into the second half, the Hotshots continued their assault in the second half, increasing their advantage to 20 points, 54-34, three minutes into the third after a Mark Barroca jumper. It was then a cruise the rest of the way for Magnolia, who will enter the playoffs with renewed energy and a higher level of play, as the game was already out of reach at the end of the third. Aldrech Ramos and Barroca came off the Hotshots bench striking as well, adding 15 and 14 points, respectively. Coming into the game, Magnolia only needed to win to secure the No. 6 seed while NLEX had to win by at least nine points to claim the ranking. The Hotshots can now breathe easily going to the quarters knowing that they will not face a disadvantage. Magnolia 102 - Lee 26, Ramos 15, Barroca 14, Sangalang 10, Jalalon 8, Herndon 6, Melton 5, Simon 5, Brondial 5, Reavis 2, Gamalinda 2, Pascual 2, Dela Rosa 2, Calisaan 0, Abundo 0. NLEX 74 - Galanza 10, Ighalo 9, Tallo 8, Quiñahan 8, Erram 7, Rios 6, Paniamogan 6, Varilla 6, Magat 6, Soyud 4, Baguio 2, Lao 2, Tiongson 0, Taulava 0, Paredes 0.